I want to make this as simple as possible for players, like a gameboard, so I can start specifying options and features in the wilderness. I was thinking that it's funny that 4e spent so much time trying to simplify and specify D&D's abstract combat, but, as far as I know, ignored wilderness travel, which has always been super abstract. Combat never seemed all that problematic to me. I mean I can pretty much imagine what the results of a few rolls mean for 30 seconds of fighting. With abstract wilderness, though, you gloss over travel through 5, 6, or 25 miles in a hex, you're missing the whole movie! Related to that, I was realizing how the default unit for D&D wilderness seems to be the hex or sometimes the kingdom. I'm thinking a much better unit to work with is terrain, and treat the terrain almost like a very large dungeon level. My last post was my first steps toward that end. I've actually grown to dislike hex maps because I associate them with these huge tracts of abstract land with little help on how to run what's in them. And numbered hexes seem very futuristic to me, perfect for Traveler but not the right tone for a fantasy setting. Because of this, I was going to try to avoid them altogether and use roads marked out with distances sort of like gameboard spaces. But I want players to be able to go off-road too and have an idea how far they can travel through a forest in a day. So hexes are unavoidably, really. I'll try to keep them grey, just visible enough to see, but not obstructing the look of the map. So, I think I've settled on hexes that are 1 inch wide on the player map and 6 miles in game. I want the hexes big enough on the map to have images of landmarks that players can see as a group. Not just one person squinting over the map. As for in-game, you can see this old post extolling the virtues of the 6 mile hex. I also like that these will work better with leagues. So I'll actually be treating them as 2 league hexes. Leagues, like stones for weight, are good because they make the numbers we're working with smaller and they're also evocative of an older time. They are also handy because human walking speed is about 3 mph so you can say every league is an hour of walking. My desire for simplicity wishes that the hexes could be one league each, but it would make the sandbox way too small. Players could walk out of it in two days. Let me back up a bit. I'm going to assume folks can walk 6 leagues a day. That's a bit low, but I'd rather err on the low side than on the high side. And keep in mind, even on roads, the terrain is probably rough, overgrown, and requiring a constant watch for hazards. This will also let me simplify horseback travel by telling players to double their number of hexes they can move. Again, 36 miles in a day on a horse might be on the low side. But another reason to keep them low is that I can simplify forced marches by just saying double your hexes. So, 72 mile for a horse being pushed is within reason as is 36 miles for hikers. I started out with four letter-size pieces of paper laid out in a rectangle. But that was too small. So I upped it to 3x3. With rough terrain slowing folks down a bit, even on horseback, it should take more than a week to get off map. It also isn't too big to have on the table in front of all the players. I don't want to constrain the players to this sandbox, but if I'm going to put work into making a lot of locations they can visit, I want it to be of a size that they can't just ditch it all in one session. Hmm, I don't know, I might still try to shrink the hex size to half an inch and make them 1 league each. Then I could have small icons representing landmarks but much larger images along the margin of the map like the last example here. I suppose design isn't finding the perfect solution, but the best compromise. I'm trying to balance simplicity of communicating travel rules to players with them having a map they can see and not walk off of in one session. If I keep it simple it should be easy enough to add complexity on top of it. So, traveling through rough terrain could halve your travel distance and traveling through some terrains in winter could halve it again. Special breeds of horses could add a hex to their travel distance, or only in certain terrains (stout ponies in hills) or seasons (shaggy tundra horses). You might even decide a certain speed rumors/news travels across the map in hexes. So, if players keep getting hirelings killed, for instance, the next village may not want to see any of their offspring hired. I think revealing the hexes really fights against a sense of brooding wilderness expanse, and allows players to go into accountant mode, calculating reliable distances and such. In one of my currently running campaigns, I use the hex maps and keys from the Land of NOD magazine. Hexes are player-facing, although they know only a few points of interest (e.g. major cities) and those they explore through play. Although I don't find the players' accountant-y approach unappealing (that's what movement rates, frequency of wandering monsters and such are for), I as a Referee find the concept less attractive in play than in preparation. Or perhaps it's just the sheer size of the thing (it may eventually outgrow the Wilderlands; counting the Hell-crawl, it probably has). How often to player really go off road? I mean trekking through the wilderness with no trails whatsoever. The idea of wandering through the woods until you happen upon a dungeon doesn't really make sense. You'd walk right past it 99% of the time. I'm drawing up a star map for a sandbox style sci-fi game and I'm finding that larger hexes are handier for marking what's in them. 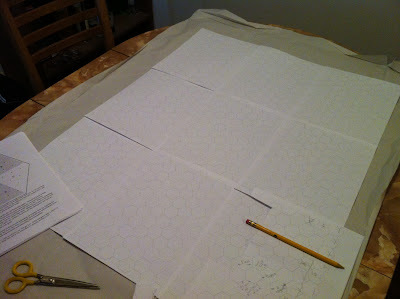 The larger hexes give me more room to draw. Also, I like your idea on working on a speed that news and rumors travel. I too like the idea of working out a "speed of rumor," although with sufficient population density it would probably just equal normal travel speed with a fractional (slowing) modifier for more mundane news and a special posting system for emergencies. That said, I don't believe simply having a horse doubles your speed, at least without changing your mount at intervals (see again: posting system.) Compared to humans, horses (and almost all other land animals, to be honest) have good sprint speed but crappy endurance. It's my understanding that if you're on the same horse all day, its speed is likely to be the same as your dismounted walking pace. The main advantages of a horse in cross-country travel are 1. increased carrying capacity, 2. saving your feet from sores and your shoes from disintegration, and 3. having a ride handy if an emergency comes up and you need to start galloping. I agree with Brendan that hexes are good for DMs, for use in calculation, but don't need to be shown to players. Great article, I never know where to start with my own sandbox. -rider knows the way and it's only thing they do. Terrain may be rough, but they don't have to look around for landmarks to avoid getting lost, they don't stop to hunt for a meal, to investigate something on the side of the trail or for any other distraction that should be accounted in travel time. Rule of thumb I heard about medievalish travel is 20-30 miles a day on a horseback. With 1.5 travel multiplier you could get in that range and still have an easy number to remember (if they start travel at the border of a hex they can travel 4 hexes and get to center of a 5th hex). ys comes from easy access to schools, books, and other media. A medieval level society wouldn't have that access for everyone. For example I have been in Korea for 7 years, mostly in one area of one city. I know lots of detail about the ditdistrict I lived in, abitabout the neighboring districts, and for special events I may have traveled to further districts. I know a few good places to eat in neighboring cities, and there are places I have heard about, but haven't visited yet. I know there is an really area far to the east famous for apples, a volcanic island in the south famous for tangerines, rocks, women, wind, and statues of old people. There is a large city near the center that is a valley. The largest mountain is somewhere to the east, a fortress to the south, and a mountain where a dragon ascended is to the north. Outside of the boarders are a malevolent force to the north that we skirmish with a few times a year, a large kingdom to the west, across a narrow rocky sea that is famous for trade, and many say we can't trust them because they also trade with the force to the north. East is an island nation that we trade with, but hold a grudge against for past conflicts. 18 miles a day is pretty decent. The the roman army managed about 20 a day and they had roads and logistics a fair bit of the time. Horse travel is really only much faster if horses are well fed and rested, lot's of horses are handy as well. Grazing along the way (something players always think they can do) also results in not getting anywhere fast. What if you gave the players a good sized map, say 11x17 at least with a few towns, some roads and some interesting sounding locations but with a lot of white space, and let them fill in the map themselves? I'd make it without hexes but to scale, so once they go from town A to town B they know it takes 3 days and can judge other distances based on that, kinda like their characters would have to. Thanks, folks, a lot of great comments to chew on. @Brendan: That is a lovely map. And I like how you've got areas ripe for travel-triangle type decisions. If an orc raiding party is heading from Flaygloom to Ilum Zugot, for example, can the party beat them there by heading through the Gristlewoods. That's the kind of dramatic possibilities I want to afford too. As for hexes, I really want my players to be able to make easy, informed decisions. My players are newer/more casual so more help for this is needed. I wonder if your players ever set out to a destination and then find they can't make it in a single day, or are they constantly asking you "how long will it take us to get to X?" @Hedgehobbit: Think more taking a short cut to a known location, or hiding from superior pursuing forces. Not a hex crawl to discover something that might or might not be there. Though that could be possible too. Check out my post on trackless wastes where I describe a Battleship-type set up to let players know where they are in a hex full of abstract wilderness. I haven't tried it yet, but I think it could go a long way to making big tracks of wilderness less abstract. @Edward: Yeah, I'm tempted to go even bigger so I can have landmark pictures be more impressive, but that would shrink the overall sandbox. Now that I think of it, the rumors idea sounds familiar, I wonder if I read it on a blog years ago. @Confanity: While horses may not double travel distance I have to think about how the system affects play. If a horse travels the same rate as walking players and only allows for carrying a bit more (hirelings could do this) and a chance at escaping encounters while also needing to be protected and fed, I doubt my players would ever buy a horse. But from what I've read I think you do cover more ground on a horse. I think it might not be a faster speed so much as horses allowing for fording small streams and pushing through brush and such faster than we can. I tried calling my uncle who has a horse and experience with trail riding, but couldn't get him. I'll try calling again. I want to ask him about the possibility of horses grazing on a picket line when you set up camp, etc. @Anon: Keep in mind the 36 miles was meant to be for roads. For woods and such I'd probably halve it. For snowy/rainy/night travel through woods I'd reduce it again, maybe as much as another halving. @wheynne: I like the idea of unknown, unexplored wilderness a lot and that is probably what is just outside this sandbox (or at least several sides of it). But what I'm interested in doing now is setting up a situation where players can make meaningful choices about where they want to go. And if all they have to go on is rumors and hazy ideas, I feel I might as well just "pop" them to the nearest dungeon and start delving. I may learn that a hazy, half-known sandbox is the best way to run things, but I want to start with the more transparent one first and see what my players do. @JDJarvis: Thanks. Yeah, I plan to talk to my uncle about horses, but I'm assuming they must have some great advantages over walkers or they wouldn't have been used so much through history. If it isn't rate of travel I need to make sure the other benefits are supported by the system. Maybe minuses to combat if you've walked all day but not if you've ridden (though I seem to recall people being tired from riding all day too). @Lum: That's a great idea and might be a better way to go. My hesitation is thinking about if I were a player in that situation why would I go to town A rather than B. Maybe B has something really cool, cooler than A. But if I don't know how long it takes to get to either A or B, at least the early decisions will just be blind decisions. I'll see what I learn if I can pull this off. The idea of giving players hex maps is growing on me - we've got these lovely, useful gaming artefacts, and yet they remain hidden behind the screen. I'm not saying hex maps of the untamed wilderness should be available, or that hex maps will be complete - if we're talking 24 mile hexes we're basically saying, 'here are some mountains' and, 'this area has some woods in it', plus the location of major settlements - to an accuracy of 24 miles! Plus, blank hex maps (think Isle of Dread) allows players to map the wilderness themselves. Kingmaker has an interesting approach to movement and terrain. The spaces on the board are irregular polygons and pieces move a set number of spaces each turn - for areas where travel is fast, the spaces are large, and for areas where terrain slows travel down, the spaces are smaller. It doesn't remove the 'players counting spaces' thing, but what it does do is make route-finding interesting. @Andy: I agree, products that provide maps only for DMs without consideration for players are more are one of those unfortunate products of our hobby that are meant-more-to-be-read-than-played. A few years ago I got really excited about the possibility of screen printing maps like these on heavy canvas so you could roll them out on the table and it wouldn't matter so much if you spilled soda on them. They would feel more like an in-game artifact. @Black Vulmea: Thanks for sharing that that is an interesting strategy. I got to thinking about it and I don't thin it would work with differing rates, for example if you decide horseback travel is faster than foot or if winter travel is slower. Because the space sizes would need to be calibrated to one rate, right?